Sorry for not updating sooner. We’ve been busy with flooding, the Easter holiday, and family dinner guests. Our phone service has been interrupted a few times, as has our internet so, when I couldn’t connect to GCP over the weekend, I shrugged it off and figured it was my connection. When Butch left a comment here (which unfortunately was caught in the spam net), I realized that it wasn’t just me. D’OH! I was finally able to access my email and the notification from Rayra. These DDoS attacks seem to coincide with holidays when there aren’t many techies available to wall them off. Hopefully this will all be fixed by Monday. Feel free to play here in the meantime! Fair warning: I’ve got the remains of Easter dinner to clear away, so I may not approve your comments in a timely manner if they get caught in the spam net! I wouldn’t have seen him with the dim light of the flashlight if it hadn’t been for his so white it was almost glowing mouth interior he was threatening me with! I lost all desire to feed the chickens in the dark after that. I probably wouldn’t see him any better in the muddy water in the daylight than at night, though. I need to carry a hoe with me when I do my feeding tomorrow morning, and watch where I put my feet very carefully. 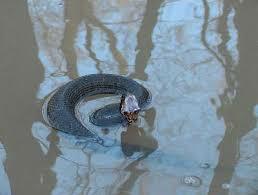 Hope y’all’s Easter was happy, filled with family and friends, and that you don’t step on any cottonmouths or ‘gators. Particularly if you have Obamacare or, if you’re like me, are now uninsured. Way too many things down there to kill you. I’ll keep the volcanoes, earthquakes and an occasional rattler. I don’t worry too much about the critters or the weather. The earth opening up and spewing lava or splitting and shaking violently just ain’t right. Hey, I’m coming to town tonight – wanna have breakfast/brunch in the morning? Hope to get outta town by 8-8:30 this time! Call me if you wanna go to our usual place? Sounds great! I’m so stuffed from Easter that I’m not sure whether I’ll be eating by then, but probably…..
As usual, enjoyable and yummy. The company is even better than the food. GREAT way to start a short road trip! Was home in plenty of time to fix supper, but Duffy took us to Rio Bravo for chicken fajitas instead. That place makes the best pico de gallo and guacamole…and the chicken part was excellent, too! See you next time, hi to the herd and the Family! So glad to hear that you enjoyed our conversation! I was talking so fast because there was so much I wanted to say before you left that I probably sounded like I was on amphetamines! The shearer just left, so after drinking about a gallon of sweet tea, I better head back out and gather up the bagged wool before the buzzards tear it open looking for sheep again. Your conversation is even better than your writing, m’Friend! Nice to spend time with someone who wants to talk to me, and even if it’s ‘bitching’ it’s hilarious! Those (insert swear word of your choice here which is incredibly vile) buzzards tore open all. 15. bags. of fleece that I’d kept. Some was so scattered through the mud as to be unsalvageable. Twelve bags had big holes in them but still held some fleece. Three bags had been shredded and wool scattered as they frantically looked for the dead sheep. Guess it is a good thing I went out when I did so that I had some wool. Hey, did you get an email from GCP as to their new website? If you haven’t posted for awhile, you might have been purged from their email list. I can’t put the link up because, well, don’t want to have the DDoS attack at the new site. I’m not sure where to ask this question, but I have 20 head of sheep in need of shearing… Would you be able to share the contact info on your shearer? I live in Mississippi and can’t find anyone. Thanks! I sent you an Email with my shearer’s contact information! Are you in any sheep associations or spinning/weavers associations in Mississippi? Usually they know every shearer that has ever been around. Hey swampie, I have been out of the loop for a week and I find I am banned from the “Banned” site and the old site is still unavailable. I’m on my work machine and have no e-mail addresses. Any thoughts? Dang! Sorry, Easy, for being so late to the party. I’ve been out of town, and haven’t checked the spam net at my site! Let me check and see whazzup. Okay, Easy! For some reason, your account, email, etc. was all linked to a banned account when there was an electronic hiccup. Rayra was able to find and fix the error. You’re clear now.